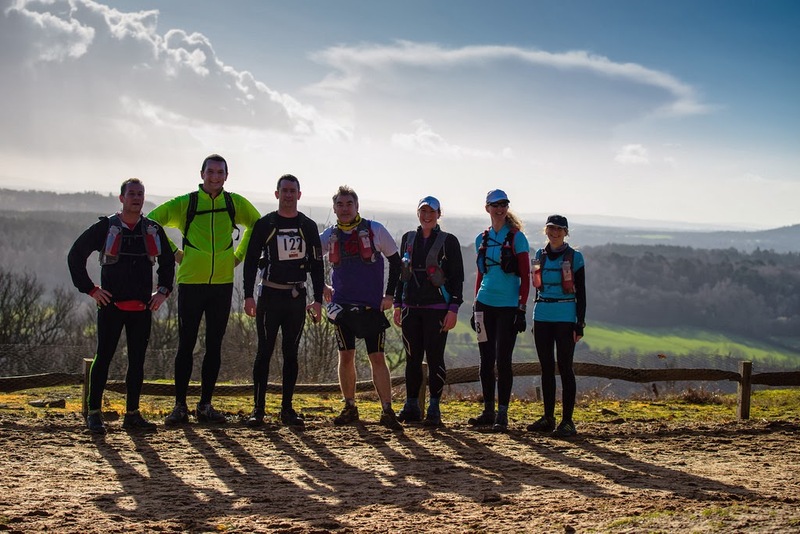 XNRG's Pilgrim Challenge was as much fun as I'd expected. 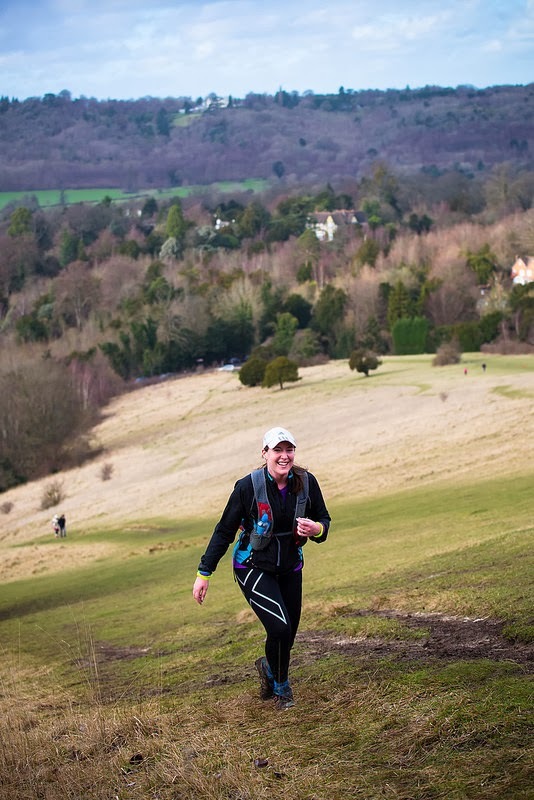 As over a week has now passed since I crossed the finish line, I've forgotten most of the details of the weekend but I do remember how much I enjoyed myself, how beautiful this section of the North Downs Way is, and how friendly everyone was. It was great to meet some facebook and twitter friends in person for the first time too (the awesome Kelvin, Susie, Shaun and Marc) as well as briefly catching up with the incredible Allan Rumbles who was marshalling. We were lucky to have pretty much perfect conditions (when you consider how atrocious it could have been given recent weather) and on the Saturday morning, we set off across boggy fields, under beautiful blue skies and sunshine, although you could hear everyone laughing or groaning after the first 20 yards as we all got trainers full of water...a sign of things to come! 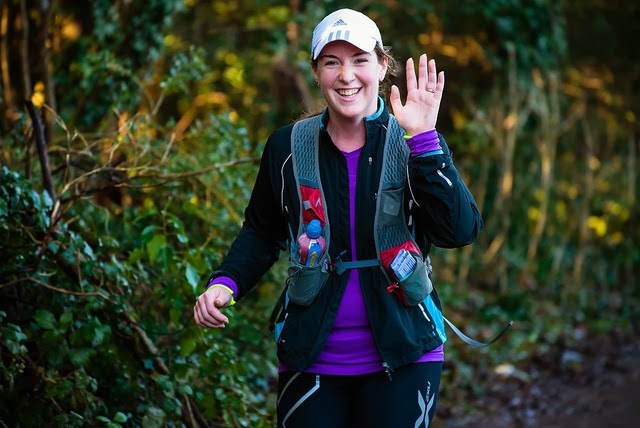 The countryside was absolutely stunning, everyone seemed in good spirits, and it was rare that I was running without others at least in sight throughout both days, although even if I had been running solo, there would have been no need to worry about navigating. XNRG are, without a doubt, the best at sorting out an easy to follow route - there were loads of official NDW acorns to follow, but anywhere there was the slightest doubt, there were orange arrows sprayed onto trees or the path. The only time a big group of us went wrong was when one of the many trees that had fallen in the recent storms, had dropped directly over the path at a junction with another path, in such a way that it obscured the correct route and made it seem obviously that we should all take a right, instead of going straight on....On encountering a dead end after about half a mile through the wood, we turned back and soon realised our mistake. The conditions underfoot were often challenging - there was lots of sections of incredibly deep and squelchy mud, others where it was very slippery, and then there were the bits where we were wading through deep water, but it was all great fun and I think everyone took the conditions in good humour. The XNRG team had to reroute the course on both days to avoid flooding that had happened overnight, and they did so incredibly efficiently, with it barely affecting the overall distance. I was quite surprised at how cheery everyone still seemed on the second day, as I don't think any of us had an unbroken night's sleep in the school hall in our sleeping bags. It was certainly not a comfortable night for me, and I was so tired on Sunday morning but the running seemed to wake us all up pretty quickly! I was really pleased that my legs were still co-operating too, with no particular aches or pains. The route is incredibly hilly, and felt especially so to me, being used to training in Essex, and my Garmin recorded a total elevation gain of 915m. 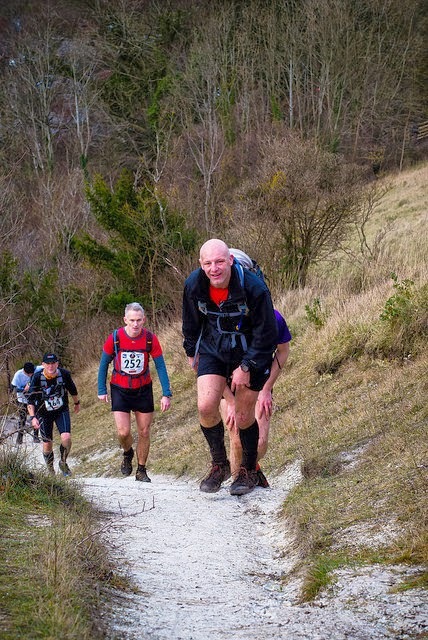 Clambering up the narrow and very steep chalk path up the side of Box Hill on day one was very hard and I don't think I really recovered my running legs after that. I walked on both days much more than I'd expected to (which I think is why I didn't have any DOMS in the days afterwards) but with the many hills and the mud, I was comfortable with how I was moving forward and just enjoyed myself. 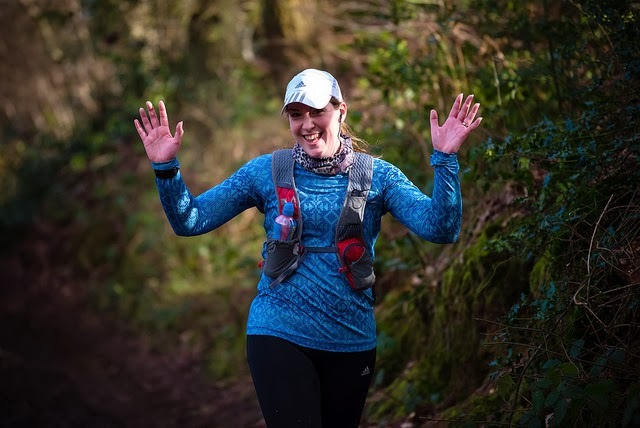 On Sunday, from about mile 18 I surprisingly had a bit of a second wind, that lasted about 10 miles - I just seemed to find a new strength from somewhere and felt that I was flying along, and absolutely loved it. I even discovered a sub 10 minute mile at mile 21 on the second day (so mile 54 of the weekend) whereas I was averaging 12:47min/mile on Saturday and 12:42min/mile on Sunday. I finished my 66 miles in the grand old time of 14hrs 6mins. I was 80th overall out of 131 people who ran both days, and was 17th woman out of 41. A decent medal and a t-shirt were the rewards. I was so glad that I'd been able to take the car and leave it parked at the start/finish. I couldn't have faced carting my rucksack and sleeping bag back into London then out again on the train, and it was nice to have somewhere other than the ground to sit down and recover ;) There were lots of people who did have to take the train though, but with no showers at the finish I felt for them (and the other passengers who would be sharing the carriages with them!) We were all so incredibly muddy! I know I walked more than I needed to, doing Pilgrim's, and even stopped to take a few photos, so hope that when I do this again, I'll knock a chunk off my time...it's definitely worth a second attempt, if just for the views! Unfortunately I haven't been able to run since as I have an injury. 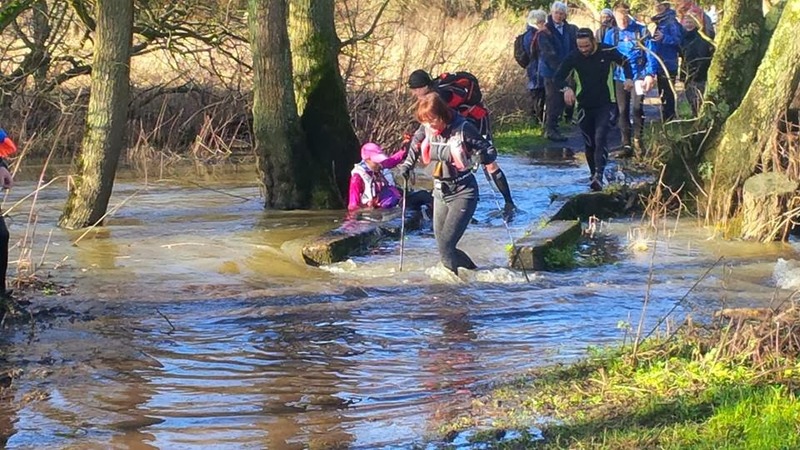 I've had to cancel my entry for ST Peter's Ultra and may bail on Thames Towpath 100 depending on when I get to run again. May try and do the Tunbridge Half as a start up - it sounded good from your review. Love the pictures!! You seem to be having a brilliant time!